Home > Haggith > Supply Glut Continues, What Will Happen with Oil Prices? 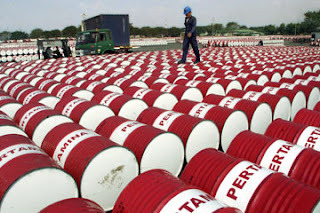 Supply Glut Continues, What Will Happen with Oil Prices? Here are several quick looks at the oil supply glut and whether it is likely to worsen, hold the same, or improve during the summer of 2016. Shell’s job losses are about to match Facebook’s total payroll. Royal Dutch Shell just announced it will eliminate another 2,200 jobs, mostly due to the oil glut price crisis. This will bring Shell’s total job losses by the end of 2016 to 12,500 people who have been terminated. Now a quick pic of how the oil supply glut is hitting banks in far parts of the world: More than 65% of banks in the Persian Gulf reported an increase in defaults in the first quarter of the year. Banks, in other words, are rolling back their profit hopes and settling into the idea that oil prices in the current low range are the new norm. This picture of one port tells a major story: Tankers are running circles around the Chinese port of Qingdao. One ship has been carving circles in the water for twenty days, waiting for a chance to offload at any one of several “teapot” (small) refineries in the region. China is the world’s second largest consumer of oil. Lack of available storage capacity on land is slowing down the rate at which refiners can take in crude, as is a reduction in the profitability of refineries, which is causing them to back off on refining. Again, a picture that looks likely to worsen over the summer. Another reason China is awash in oil along its shores is that many OPEC nations took out loans from China that were repayable in oil, not dollars. These nations are now repaying their loans in oil to get more loans in money because they have a lot more oil than money. That’s causing more oil to flow to China than it can use. Yet another reason for oil oversupply in China is that Saudi Arabia, Russia and Iran are all caught up in a oil price war over market share in Asia. That, too, is not going away. Oil supply looks constipated off the coast of Singapore, too. … like rush hour on the freeway or like swimmers in the ocean at Waikiki. Add in all the other kinds of vessels, and it looks like you could walk across the straits, leaping from vessel to vessel between any two points of land. The number of tankers that are serving as offshore oil storage in the area is increasing at a rate of 10% per week. Who is creating this tanker backup and does it have anything to do with jacking up oil prices? So, yes, this is, at least in part, according to Reuters, a “rigged” market, pardon the oil industry pun. Oil prices are being manipulated upward by some serious attempts to corner the market. Is the backup of oil tankers a sign of oil oversupply in other parts of the world? Outside my window I can see 6 supply/stand-by ships from the oil industry without assigment! And they are everywere along the Norwegian coast! So Norway is in no way doing as great they like to show off to the world. Its going downhill….. But is this backup of oil tankers financially insane? Storing oil in tankers doesn’t come free. You pay by the day, so profits of the shipment go down the longer the oil sits on the sea. Ah well (sighs). I’ve been trying to make them aware of it! But people don’t see what they don’t want to see, even when an oil slick is floating right past them. What is oversupply likely to do to oil prices this summer? Canada’s temporary oil supply interruption could go away as quickly as Libya’s did, causing the supply glut in the US to build at a quicker pace. US refiners also still have 10,000,000 barrels of crude in floating storage in the Houston area. And US oil rig count finally ended eight consecutive weeks of free fall, holding flat last week. Nigeria’s production, which helped pick up oil prices when it fell due to attacks on Nigeria’s pipelines, is already returning toward normal. Nevertheless, the inventory build in the US dropped more than expected in the latest report today, bringing oil prices to a seven-month high. In spite of the storage drop, however, oil failed again to push through $50, which has been looking more and more like a firm ceiling. Of course, if the Fed does what it cannot do but says that it will and raises interest rates, that will raise the value of the dollar, making petrodollar-priced oil more expensive for most of the world, which would likely suppress global demand a little, countering the normal summer rise in gasoline demand around much of the world. So, all is fragile and continues to hang in the balance daily, but the factors that have reduced the glut appear to be abating, while some of those that could increase it are growing.